Before I pull the trigger on a spray rig..
After spraying 20 or so guitars with aerosols, I think it's finally time to move into the big leagues. I keep hearing good things about this Iwata gun. There's a few different nozzle sizes available. I'm guessing 1.0mm is suitable? But I'm not sure about compressors. Would this 2.5HP be a good match? I've read that some say 2HP is enough but my budget will allow for a bit more. most compressors will need a pressure reducer to manage the low amounts a HVLP gun needs. Its usually capacity that is the issue. I had an Ozito compressor which lasted almost 10 yrs and now have the Project Air. I have used ozito guns recently too......surprisingly good. The key is good quality hose fittings, a water trap and the accurate gauge to adjust pressure to the gun. I have been using Apollo HVLP spray systems for 30 years and they work great. I've had 2 turbines (the original one still works) Get a good airbrush for sunbursts. The hvlp systems reduce a lot of overspray problems so neighbours will be happy. Something like this should do you well. https://www.sprayequipment.co.uk/apollo-prospray-1500-3.html (I have no connection with the seller) Just google Apollo 1500 or check out the fuji systems ( the fuji guns are nice i've got 2) Small matching hvlp guns suitable for sunbursts are to be found by googling skin tanning aplication. I use Devilbiss guns. The SRI PRO is my go to for shaders and clears. I use a 1.3 tip, I think 1.0 will be a bit small for most modern coating formulations..
From a person who paints the occasional car, even a standard 1HP 20-30gal tank air compressor is more than enough for painting a car. A small little pancake style air compressor should be more than enough for a guitar. Like others said, HVLP only uses a few lbs of pressure. If spraying lacquer, it is really thin and you do not need much air flow or air pressure. A 1.0 tip should probably be OK. If spraying some more modern high solids coatings, you will need a bigger tip (1.3, 1.4) and might have to boost your pressure a little bit to get the coating to spread out. Most paint guns are all of the same basic design whether cheap or expensive. Get the bigger tip as you can always reduce the flow through the nozzle by setting the stop on the needle. Which air cap is that gun supplied with? I think I've heard the E2 being preferred for guitar work but check that. I know this because i when and ordered one with the E4 cap before i realised there was a difference, doe! Well I decided to try the cheap route and bought the Ozito gun set @$69AUD and a cheaper 2HP compressor at $176AUD. That's about $50 and $125 USD respectively. At $69 i figure if they're crap I haven't wasted a lot of money. Tried it for the first time spraying the amber of my LP build. I think it came out great. I tested with water a few days ago to get a feel for the controls. Still learning. I've used prevals in the past and took a lot of time and a lot of thin coats to get even coverage and enough colour. This took a lot less coats and a lot less time. So far so good. I'll be spraying the burst with the smaller touch up gun on the weekend. The next 2 days are scorchers here in Melbourne. Thanks for recommending the Ozito guns dude. Here's a question. 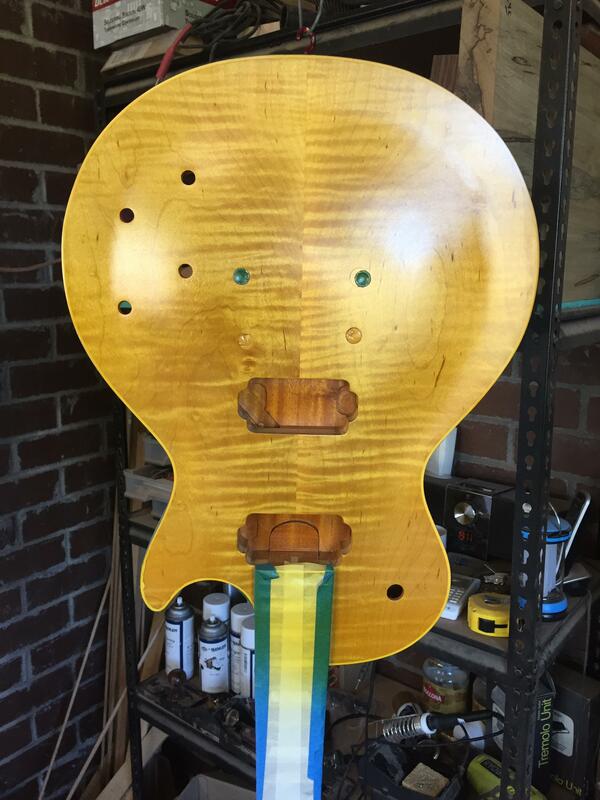 How much lacquer would you use for clear coats. If I was spraying aerosols I'd use 3 cans but I'm guessing spraying the equivalent out of gun is overkill. I always hear people talking about "x" amount of coats but I'm guessing that can vary due to their gun settings, technique etc..
3 cans sounds like barely enough.....but it's been years since I used cans for guitars. Typically most here go for 9-12 coats of clear.....a coat being 3 passes over the instrument. This allows for the usual sanding during clear application, plus finish buffing whilst keeping a nice deep gloss. I thin 50/50 and also do 1/4 strength passes for flattening out the orange peel a bit.